Bournemouth manager Eddie Howe and his assistant Jason Tindall have both been charged with misconduct by the Football Association. The charge relates to the 2-2 Championship draw against Sheffield Wednesday on 18 April. It is alleged Howe's post-match comments constitute improper conduct. Tindall is accused of using abusive and/or insulting words and/or behaviour towards a match official. The pair have until 18:00 BST on 27 April to respond. 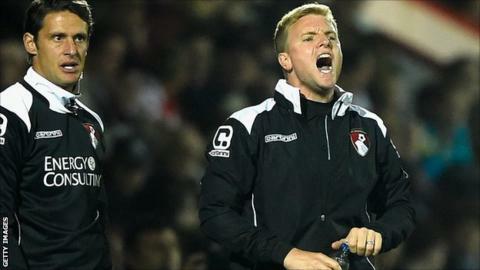 Following the match, Howe claimed there was a conspiracy among referees against striker Callum Wilson. However, after receiving notice of the charge, Howe suggested he would think twice before commenting in future. He told BBC Radio Solent: "I take my role as a role model very seriously as a manager. "One of my core principles when I took the job was to always respect the officials - they have a very difficult job - and to try and act with dignity, to never confront a referee or show that indiscipline during a game. "I've maintained that and never fell foul of that in my time as a manager. What I do try to do if someone asks me a question is to always give them an honest answer, what I feel at the time is my opinion. "Obviously this time that's got me in trouble, so I'll have to review what I say and think very carefully because you don't want to be coming across in the wrong way. "I gave what I felt were my honest feelings at the time." Howe had said he believed his side, currently second in the Championship, should have been given a second-half penalty for a foul on Wilson.